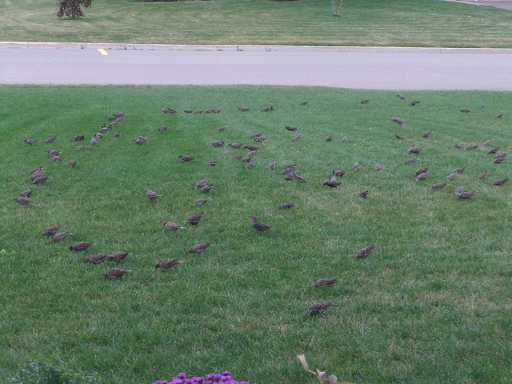 European starlings are in the neighbourhood and on wet days, they land on the front or back lawns. 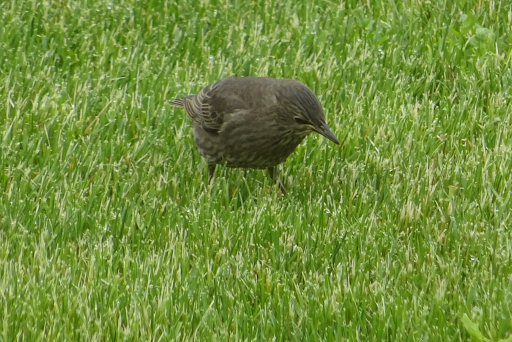 They are stout little creatures, with long, sturdy, pointed beaks. 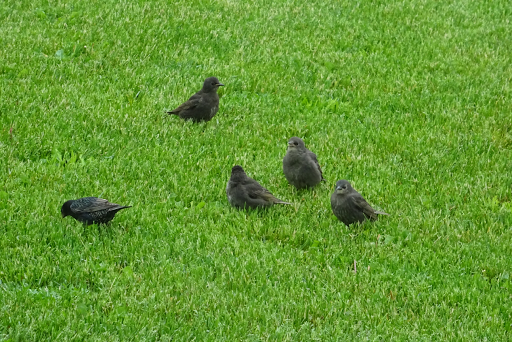 The young birds have grey brown colouring, the older ones are black. 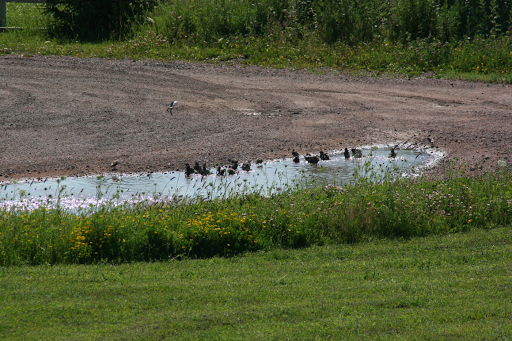 They do everything as a flock and are noisy, flying around the neighbourhood looking for their next meal, a drink or a bath. A dead tree in the neighbourhood is a favourite observation deck. 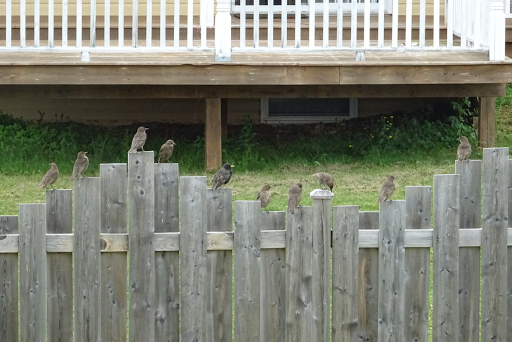 If we make any noise while they are on the lawn, they fly to the nearby fence to assess the threat. 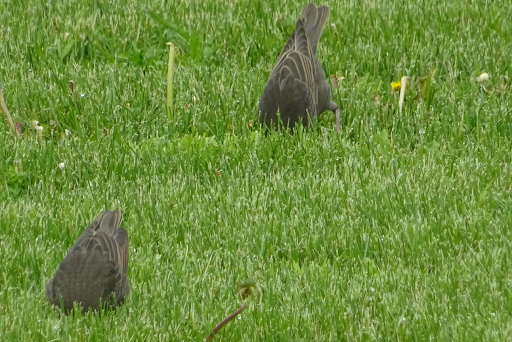 their heads are deep in the grass as they dig for insects, worms or grubs after the rain. 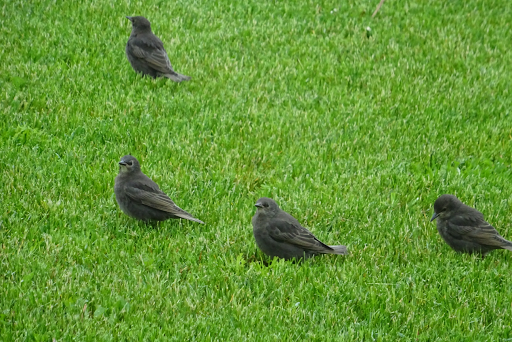 These starlings were introduced to North America when one hundred birds were released in Central Park, New York in the 1890s. 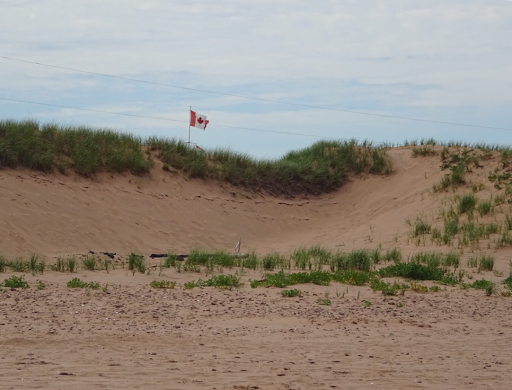 Many generations later, there is a flock in Summerside, Prince Edward Island, descendants of those immigrants, who adapted and made the best of their lives on the new continent. It sounds like a familiar story. Bottoms up indeed! 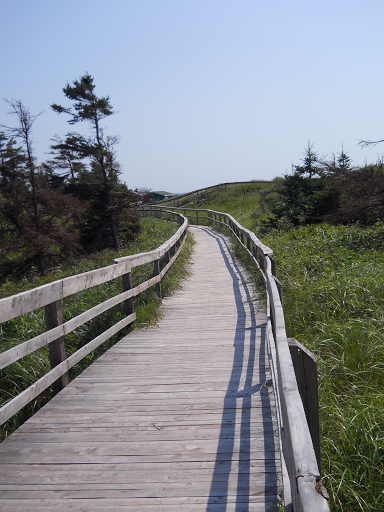 Boardwalks are plentiful here in Prince Edward Island. 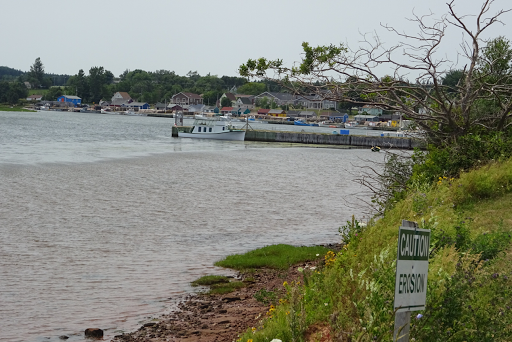 We frequent the one by the bay in Summerside as do many other residents. All around the province, boardwalks attract people to the outdoors, by the ocean, over marshes or wetlands, in parks and towns. Islanders are fond of their boardwalks. This summer my husband and I are exploring more of our island home as we can drive from east to west in several hours. 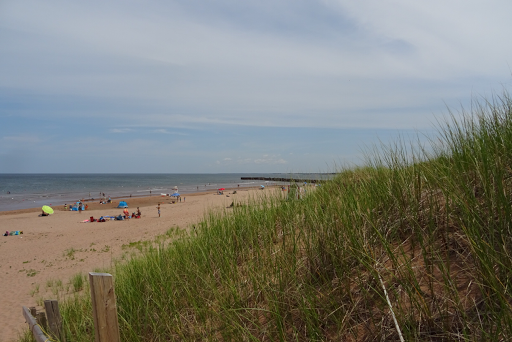 Our most recent discovery is the boardwalk in North Rustico, northeast of our home. 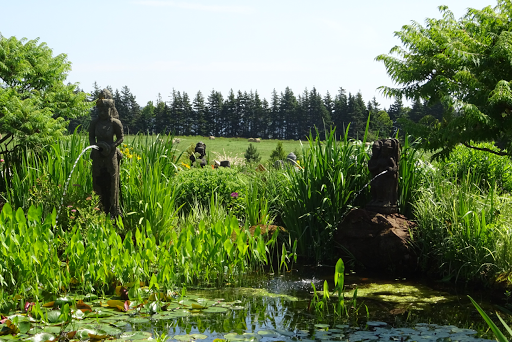 The hot summer day did not dissuade us since we had natural air conditioning again, an east coast breeze. 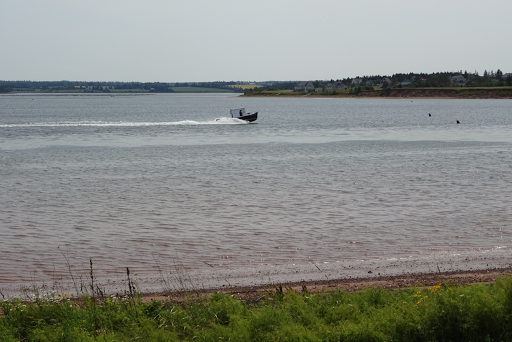 North Rustico is an area which was first settled by Indigenous people at least 6000 years ago. Then the European explorer, Jacques Cartier, sailed along the coast in the 1530s. 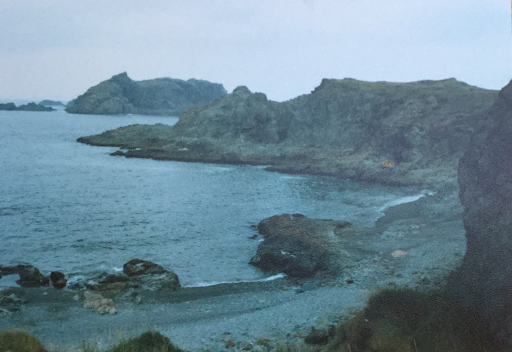 Rene Rassicot fished in the area in 1729 and named it. Rassicot, with the silent t, became Rustico over the centuries. 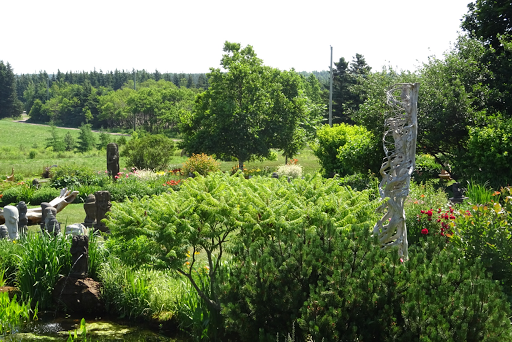 By the 1790s, the first French settlers, Acadians, built their homes in the area. 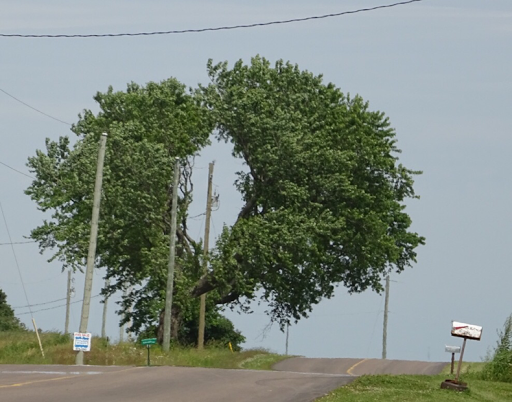 Descendants of those first Acadians live in the area today. 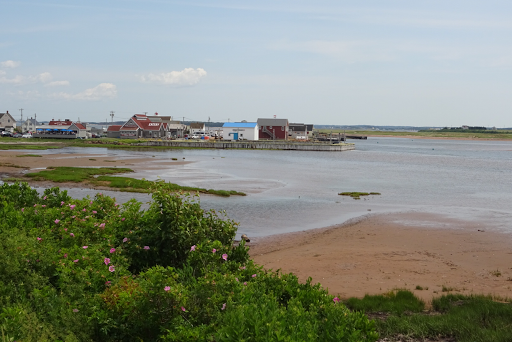 This part of the province still is involved in the fishery. The community has less than one thousand permanent residents, but that number swells in the summer when cottagers return and visitors flock to the area. Meanwhile, life in the community continues as it has for centuries, linked to the sea. Now however, the tourist industry is also a part of that lifestyle. We shared our day in the community with many other visitors, most of whom were from other provinces and states across the border. The boardwalk runs along by the harbour, a prime location. 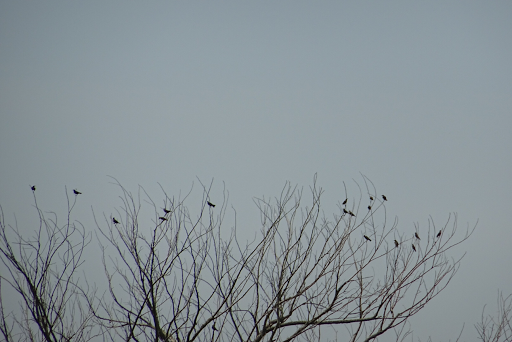 and trees, where birds sing their varied melodies in the thick vegetation, unseen but not unnoticed. 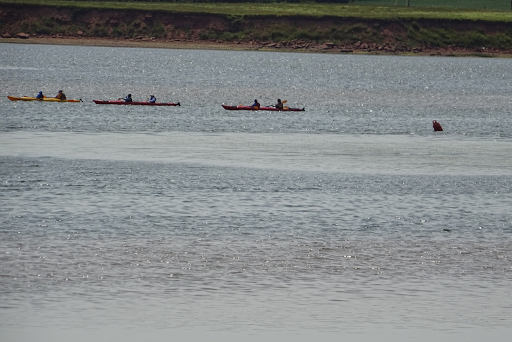 and share the waterway with kayakers this time of year. Overhead an osprey is making its presence known as herons wade in the water. 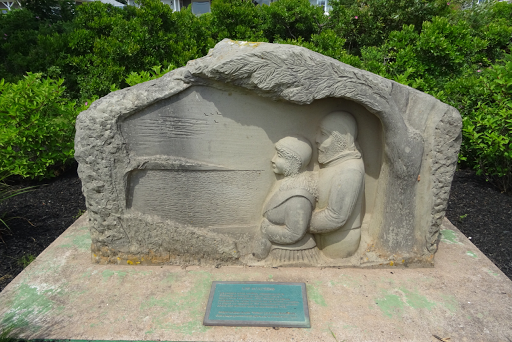 Along the path, various monuments mark people and events which are significant to the area. At the end of the boardwalk near the entrance to the harbour, if you cross the road and follow the path, you will arrive at the beach. 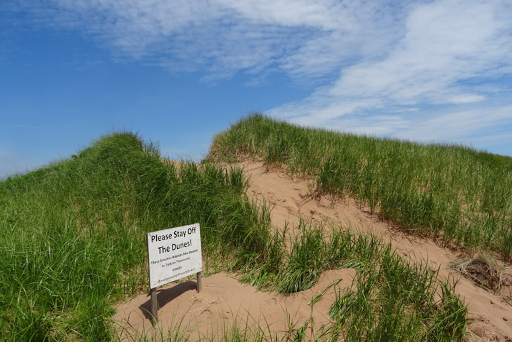 Sand dunes obstruct the view of the beach which opens before you on the far side of the dunes. The beach is crowded, by island standards. 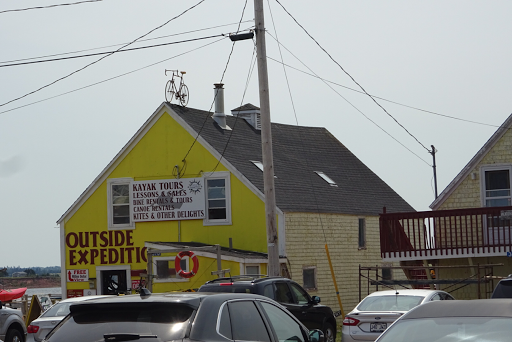 At the head of the harbour, rental places and eateries attract visitors. 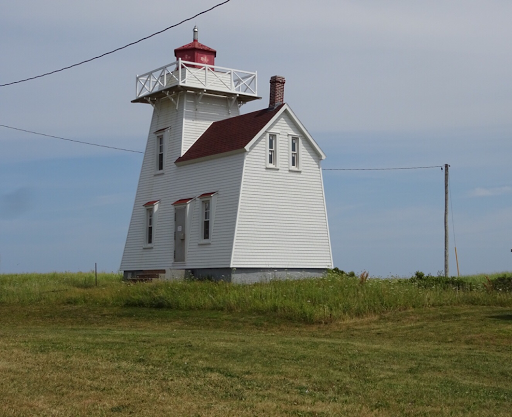 This lighthouse is one of four remaining of those which housed keepers and their families for decades. 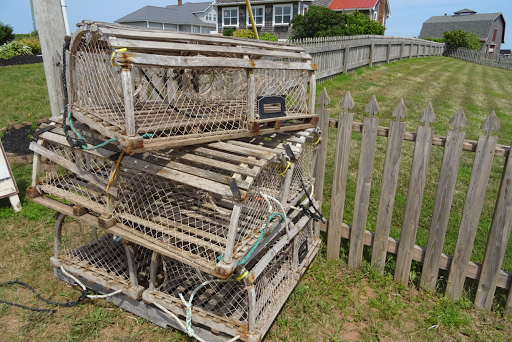 Lobster traps are for sale but don't look out of place. 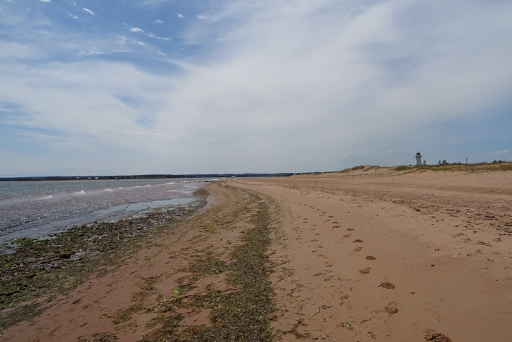 In the last six years, I've grown accustomed to beaches in Prince Edward Island. but the essentials are the same. Growing up in Newfoundland, I spent time with my grandparents every summer in Maddox Cove. Their house was set back and up from the ocean with Motion Bay spread out before it. The breeze through the trees and the sound of the surf were constants. My grandparents and Uncle France enjoyed my summer visits as much as I did. However, Nan was nervous when I was around the water. She warned me to stay away from the ocean because a tidal wave would come and take me. 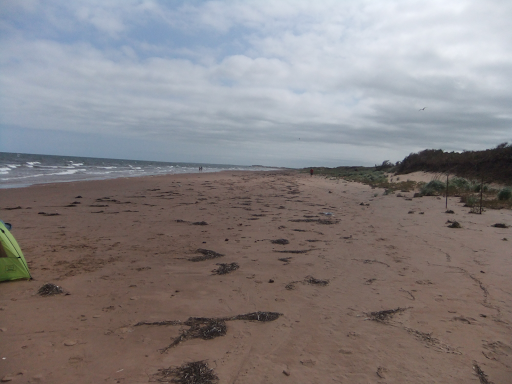 When the other children went swimming on the beach, I was to stay out of the water. I didn't; I wasn't going to be the only one sat on the beach. Aided by my Uncle France, I swam as much as the other kids. There was little sand on that beach, mainly beach rocks, rounded by the wave action. The North Atlantic was bitterly cold, but after a few minutes in the water, you felt warm or numb. We didn't mind it, the fun distracted us. Besides, who would admit it was too cold to swim? 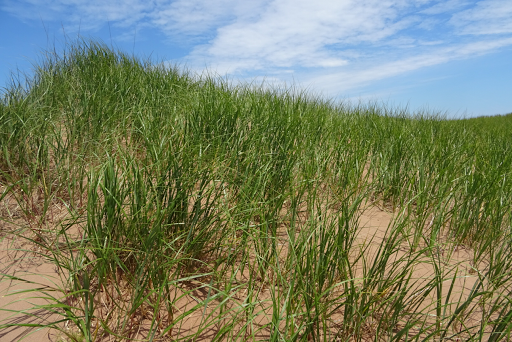 Today on Prince Edward Island, the dunes are different from the shoreline of Maddox Cove. Red sand replaces beach rocks. 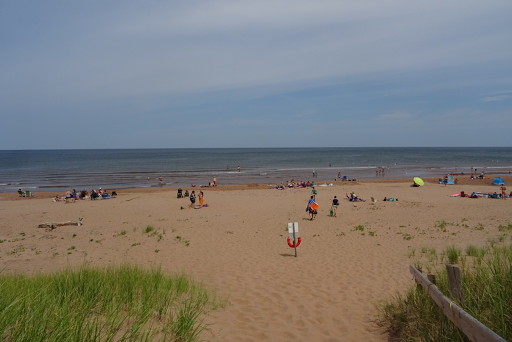 The water is warmer too; the Gulf of St. Lawrence is not as cold as the North Atlantic. These days I don't venture into the water; the years have washed away the desire to swim. In spite of the changes, my spirit recognizes the essence of the scene, prompted by the wind and the surf. A feeling of freedom pours forth, in sync with the ebb and flow of the tide and the breeze. It is good to be home. Come join me for a few seconds. and time away from the noise of the world. the Gulf of St Lawrence is visible in the distance as we make our way down the hill. 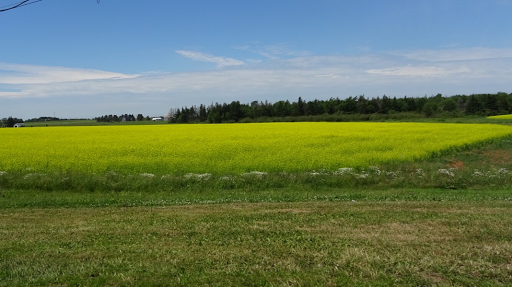 Along the road from home, fields of crops, such as canola, dot the landscape. 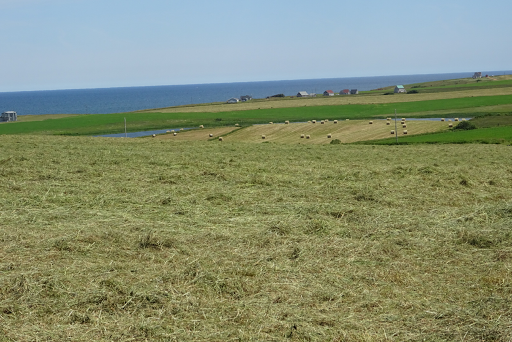 Looking out over this part of Prince Edward Island, there is new mown hay in the nearby field, while in the distance, the hay has been baled. 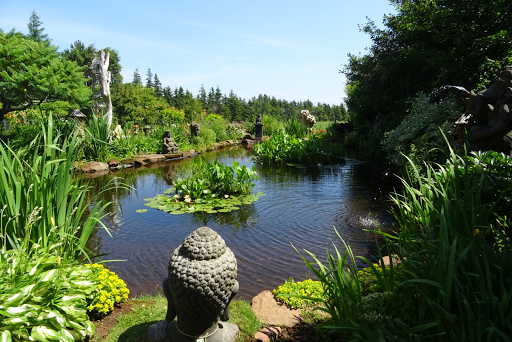 It is sunny and hot, with the east coast breeze as a perfect air conditioner. 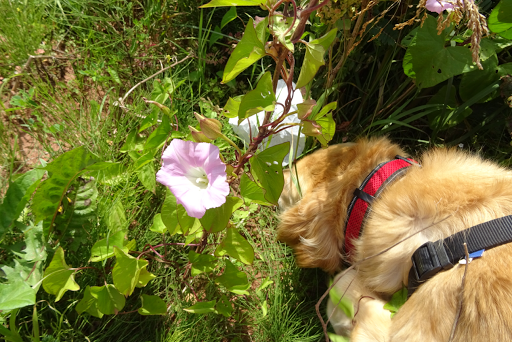 Georgie, the golden retriever is glad to be out of the car to check out the area. 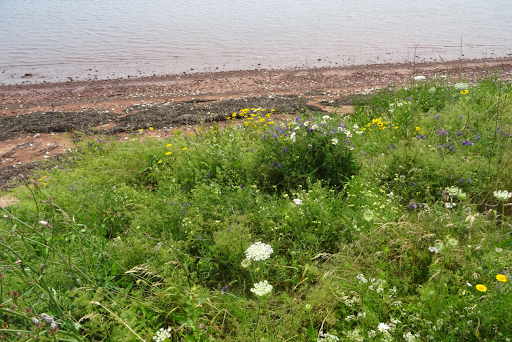 The wildflowers are abundant along the road to the beach. 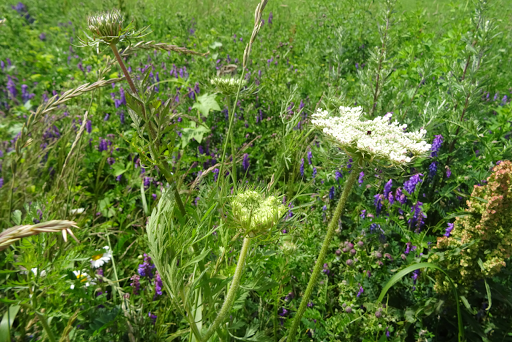 One white flower is the wild carrot, also known as Queen Ann's lace or bird's nest. 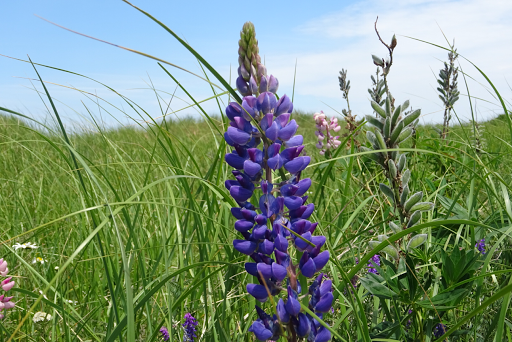 As we approach the dunes, the most obvious flowers are the lupins. They are throughout the countryside this time of year, many having already gone to seed. 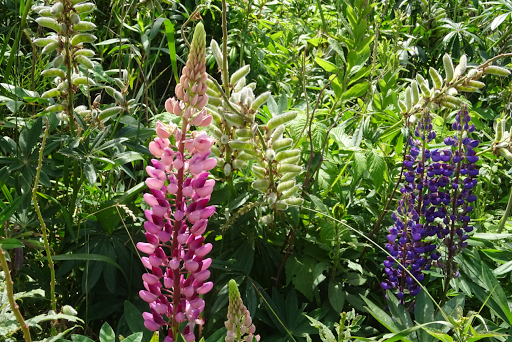 The pink and red blooms are a treat for the eyes, brighter than the traditional purples. 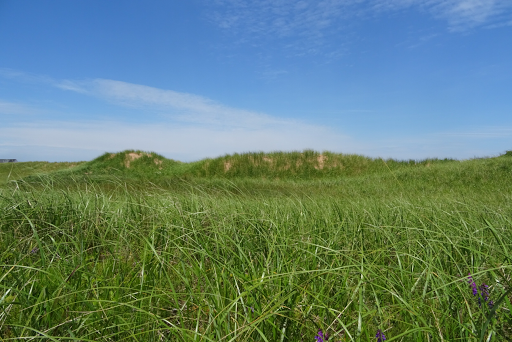 Marram grass covers the dunes and keeps the sand in place. The grass has an underground network of stems called rhizomes, from which the roots emanate. This network is destroyed when people walk over it. The sign is an important reminder to stay off the grass. As I head towards the beach, I am filled with anticipation. The best is yet to come! These days, I only listen to or watch the headlines. Over time, I read about a news item, but I cannot stand the constant theorizing of the experts, the pundits who offer opinions on the latest disaster or tragedy. I want the facts. Besides, people around me follow the details of the news which haven't been good in many parts of the world. Meanwhile, in Canada this past month, a ban on kids' road hockey in Toronto was a news item across the country. Generations of young Canadians grew up playing hockey on streets and roads all over the country. "Car," one would shout as the kids moved to the side of the road. Today, nets are moved too, a new addition to the game. Years ago, rocks or pieces of ice marked the goal, no need to move them. Road hockey in Canada is a part of the culture, as much as ice hockey. Many kids progress to ice hockey from road hockey or in addition to it. Others practise what they see in professional hockey on the road, never playing on skates. The uproar in Ontario meant the ban was scrapped. Canadians breathed a sigh of relief. The second news item which was discussed across the country was about a children's lemonade stand in Ottawa, Ontario. Two young sisters, selling lemonade to raise money for summer camp were shut down because they lacked the proper permits. Following the publicity, the girls had numerous offers of money for camp. Their parents could afford camp however and wanted the girls to learn to work for things they desired. Eventually, after a national discussion, the federal agency which shut down the stand, gave the girls permits to sell lemonade for a charity supporting a camp for children. The sign on their stand had to be in the two official languages. 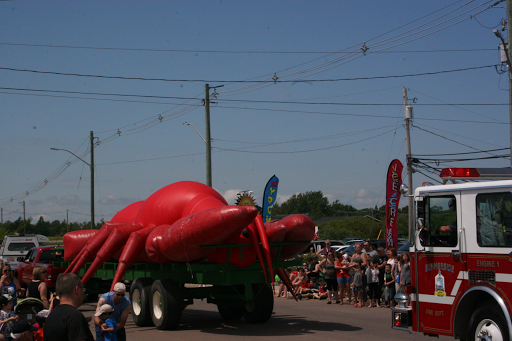 In Summerside, Prince Edward Island, news this week involves our yearly homage to that tasty crustacean, the lobster. 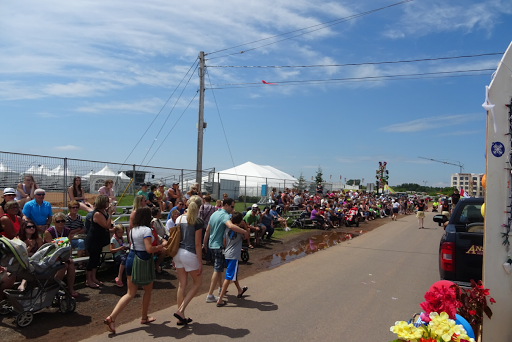 A parade is part of the festivities and various events highlight the week which includes a diverse city festival, sponsored by the Newcomers Association. Our city has immigrants and refugees from around the world. We celebrate them this week as well. Oh Canada...it's been a good month! 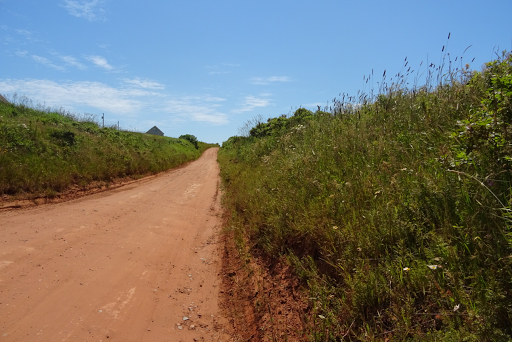 We have walked the grand-dog on the Confederation Trail here in Prince Edward Island, Canada, for several weeks now. 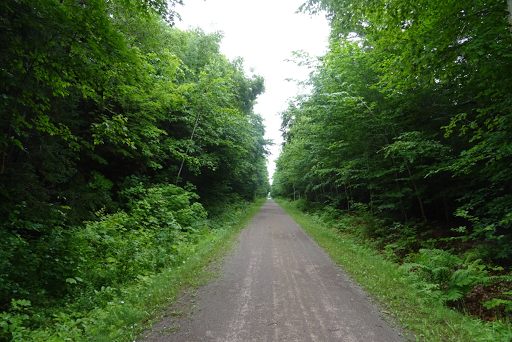 The trail is the former rail bed and is lined with trees, wild flowers, shrubs and ferns. 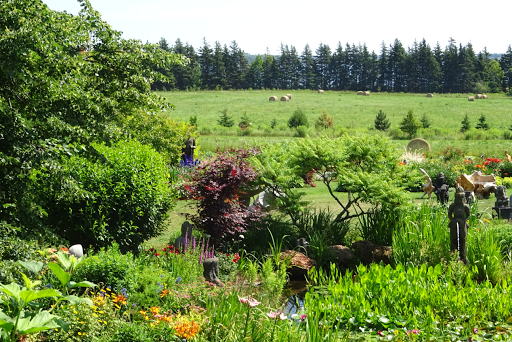 The wind in the trees soothes the spirit and the full bloom of summer has given the trail two walls of green. 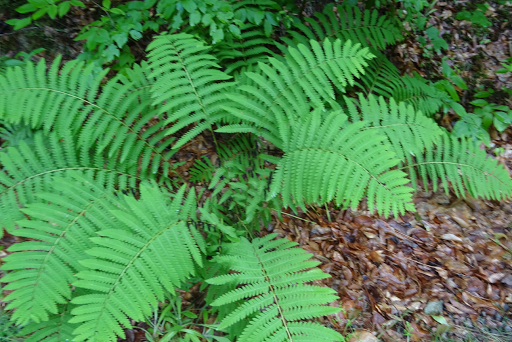 Part of my fascination with the trail has been the varieties of ferns with their beautiful leaflets and fronds. 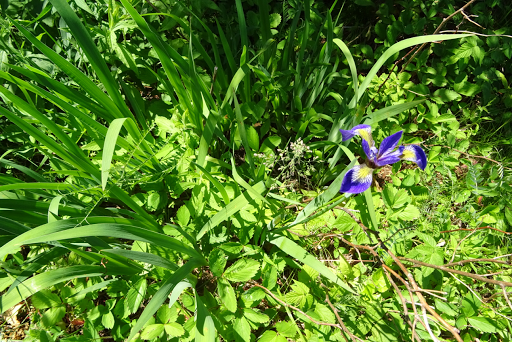 They are plentiful, lining the sides of the trail, in the shade of the trees. 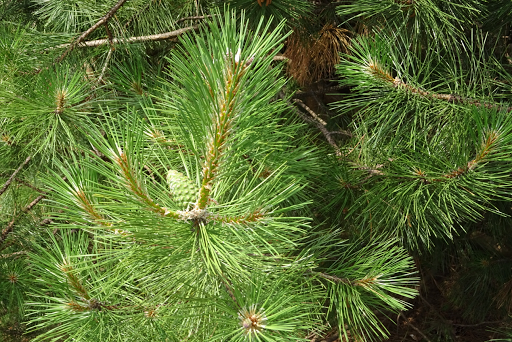 All are vibrant shades of green and some varieties grow from a central point. 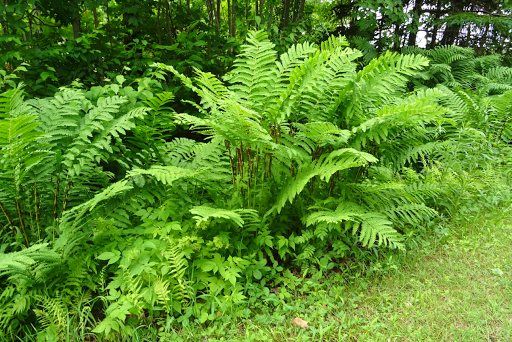 When I was young, we grabbed such a whorl of fronds about six inches above the ground and pulled out the root looking for the "banana," as we called it. If you peeled back the hard covering from the root, the center was soft and tasty. We ate them every year, without ill effect. Our ancestors used many of the edible items in the environment to supplement their meager diets and passed the information on to the next generation. 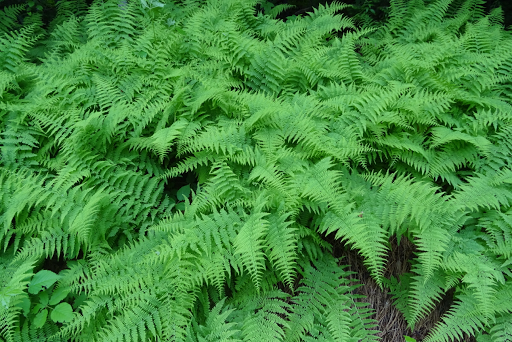 My generation didn't eat the fern root out of necessity but because we could. 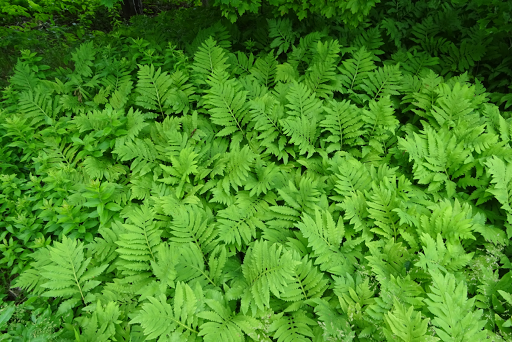 People speak about foraging today as if it is something new. One of the top restaurants in Canada is located in St. John's, Newfoundland and the chef forages for some items on the menu. We are going back to our roots again, even in the restaurant business. 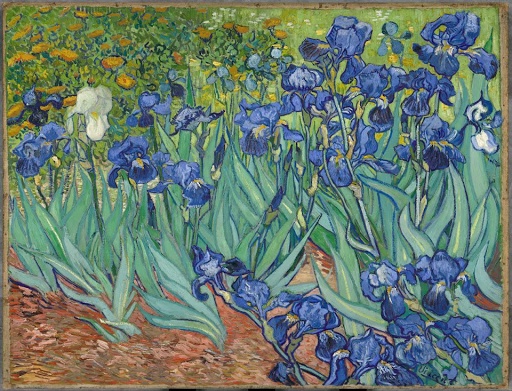 In the last year of his life, Vincent van Gogh painted irises he observed in the garden of the asylum at Saint-Rémy-de-Provence, France. We have seen several of these paintings during our travels. 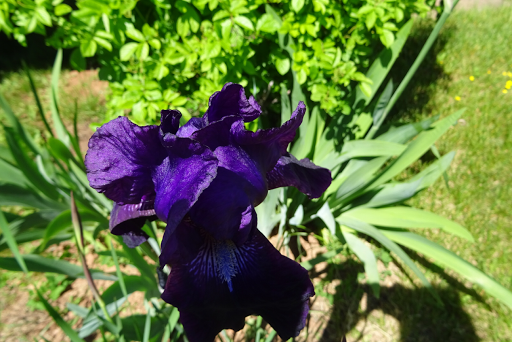 The camera replaced the paint brush for me and I took numerous photos of the irises in my garden these past weeks. Some are like velvet in texture and indigo in colour. 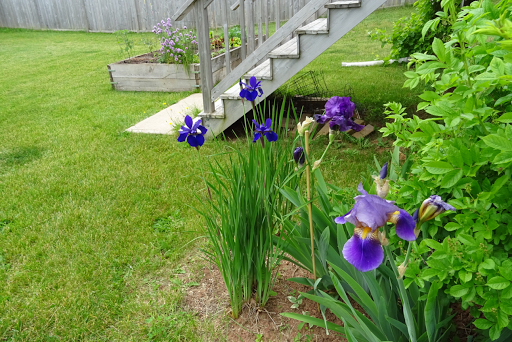 These Siberian irises are small compared to the violet German irises with which they share the flower bed. The richness of colour makes them regal, and the size and texture make for interesting comparisons. 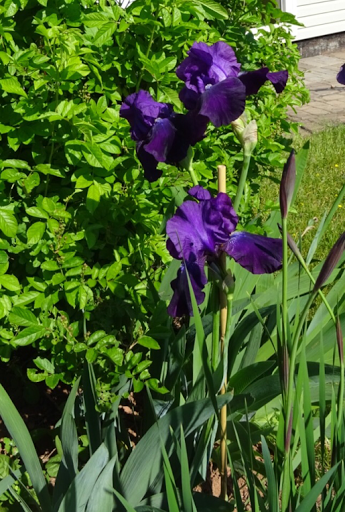 The German irises, though bigger, are no less beautiful, with their rich texture and colour. 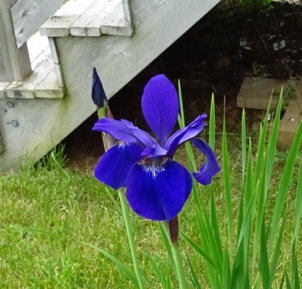 Some are a dark colour while others are lighter shades of purple. A cluster makes it difficult to pass them without stopping. 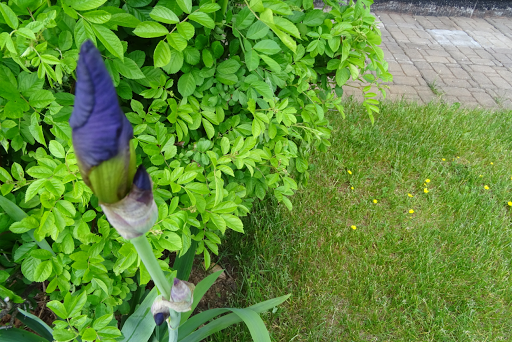 Even the bud, reminiscent of an open tube of lipstick, is remarkable. 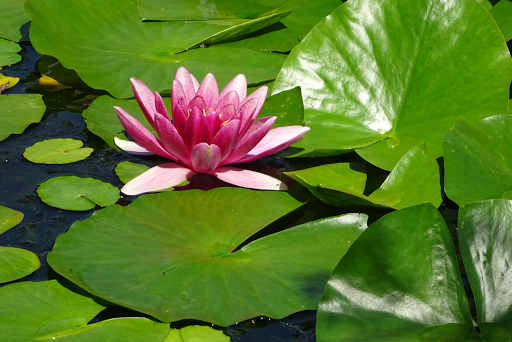 We work to have these beauties in the garden but nature makes it look so easy. 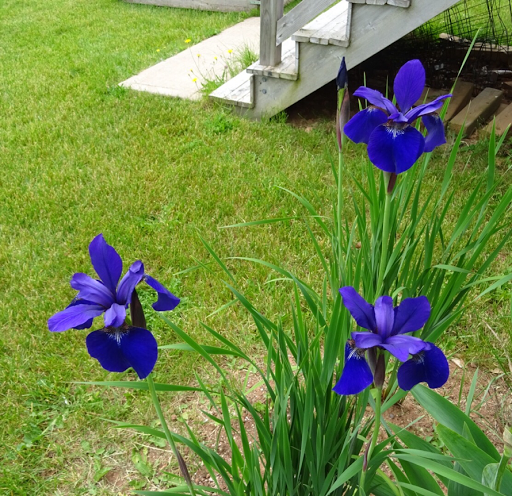 In a recent visit to Belmont Park on Prince Edward Island, there was a blue flag iris in all its natural beauty. It was a competitor, vying for a position in the woodland setting. 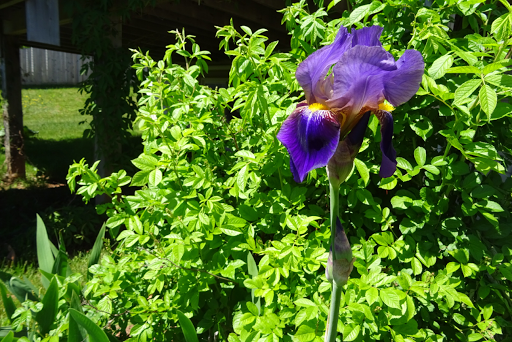 Without daily watering in the heat of summer, the iris stood out as a beacon, slender yet hardy, splashed with yellow and white. 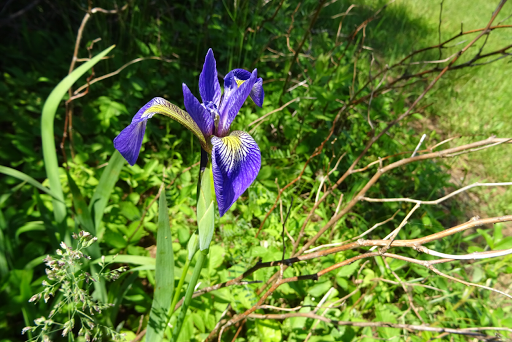 Though the irises in the garden are beautiful, there is nothing quite like those found in nature.